The Grub Street Lodger: A Lecture of Rasselas containing a big surprise. It’s been a hell of a strange week; I suffered wardrobe malfunction at work, I was asked to show a librarian how to read, I got free tickets to ‘Made in Dagenham’ and I had much fun playing with the NGM crowd but the strangest part of all the week happened on Tuesday. On that day I went to see Belinda Jack, Professor of Rhetoric at Gresham College do a talk about Morality in Johnson’s Rasselas. I had previously watched Jack’s six lectures from last year (all available on the Gresham website, along with about 1,500 other lectures). They were about the mysteries of writing and, although I sometimes lost the thread of her arguments, they inspired a lot of thoughts in me. In particular the one about how novels beguile the reader, appealed to me a lot. So I was a little disappointed when she described Johnson as ‘known, above all, for his misanthropy and profound pessimism’. While I would be first in line to agree about the pessimism, I would fight the charge of misanthropy every inch of the way. One of the most noticeable things about people that read and study Johnson is how fanatic they become, how much they love him. Opening his house to complete strangers because they are ‘poor and honest’, or raising a freed slave almost as his son and leaving him everything, do not seem the acts of a misanthrope. And so on we went, with me rather disagreeing with much of what was said. 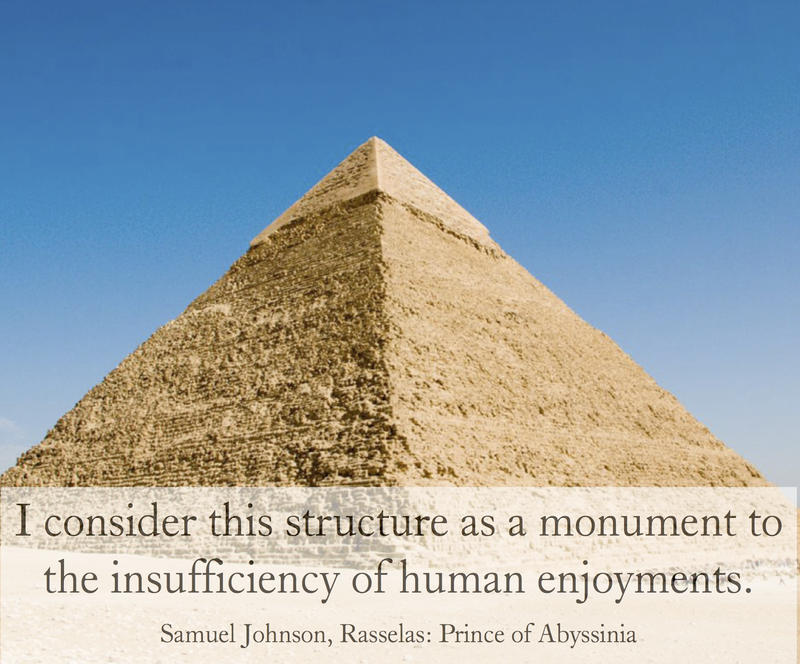 Then we went on a tour of the book and when we got to the part of the book at the pyramids, she put up the following slide, causing a titter. Hang on, I made that picture for this blog post here. It’s got my crummy photoshop skills in it and everything. I have to say I was quite flattered, as there was a good 50 odd people at the lecture, probably more people than ever read this blog. I do not know whether Belinda Jack ever read my blog, the Rasselas review is halfway on Google’s second page if you type ‘Rasselas review’ and the picture on the first of the image search, maybe she only saw the picture. As a conclusion, she talked about how far you could read Rasselas as a satire and she went through various jokes and lighter moments in the book. A lot of these moments were ones I had also seen and picked up on in my post and so for the end of the lecture we were in complete accordance. I was especially chuffed because as I queued up for the lecture, I tried to chat with the regular Greshamites, who were rather sniffy at me so it was infinitely pleasing to know that at least some of the talk I was deemed too uncouth for, originated on this blog. PS. As November approaches, I wonder the eternal question, ‘do I bother with Nano this year?’ Plus that big Death of a Dreamonger announcement and a review of the Gothic exhibition at the British Library.